Saturday 10 June sees the return of our annual Graduation Ball, where we will celebrate our final year members’ graduation at the Union, Highfield campus. The evening will be your night to look back over your time here at University and make even more everlasting memories. Our Grad Ball Committee, made up of a group of seven students from across the University, have taken a central role in the organisation of the night, choosing everything from the venue to the theme, which will be revealed shortly! Stay tuned as we will be announcing more information as the evening draws closer, so prepare your black tie and formal dress for what promises to be an unforgettable evening. Tickets will be available to purchase on Friday 17 March for only £35, giving you more exciting chances to celebrate for less*. 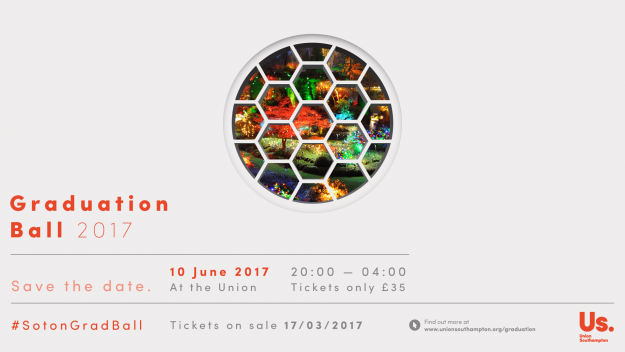 Our Ball sell out every year, so ensure you get your tickets with urgency to avoid disappointment at www.unionsouthampton.org/boxoffice. *Tickets will be priced at £40 from Thursday 01 June 2017.